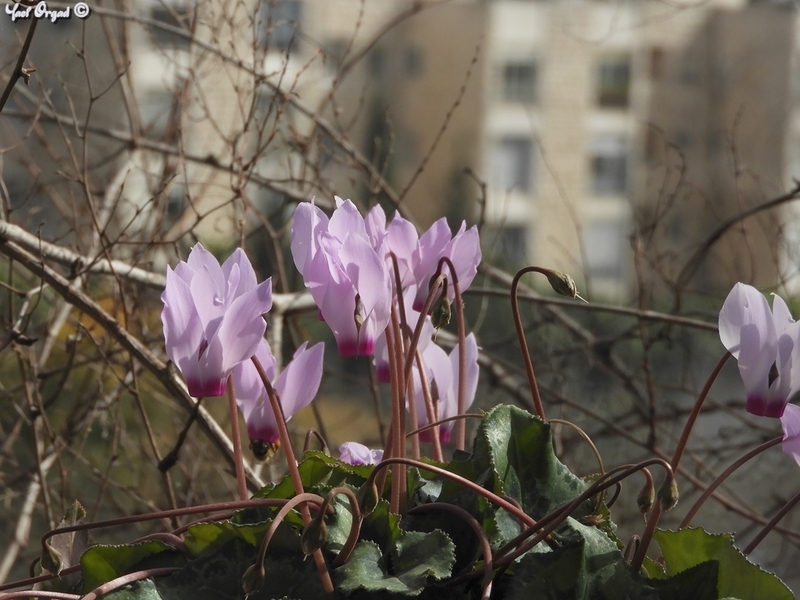 One of the lovable and well known flowers in Israel is the Cyclamen persicum. 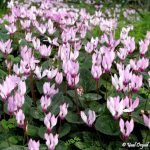 The Cyclamen is very common here and found all over the Mediterranean region in a variety of habitats – in the sun and in the shade, in rocky terrain and in the sands, on the mountains, in the valleys and on the coastal plains. The bent flower looks so familiar – but why bend the flower? The Cyclamen is a winter-flower that usually blooms between December and February, the rainy season. The flower has evolved upside down to protect its stamens and pistil from raindrops. The reversed flower is not a unique “invention” of the Cyclamens – other winter-flowers have bent down flowers, such as the Muscari, the Fritillary and others. It is accepted in the literature the that cylamens are buzz pollinated, but in a pollination research of the Cyclamen persicum, done in Tel Aviv University by Dr. Racheli Schwartz-Tzachor, some fascinating revelations were made. Racheli found that there is hardly any self-pollination in Cyclamen flowers, they require foreign pollen (from another plant) in order to produce fruit. 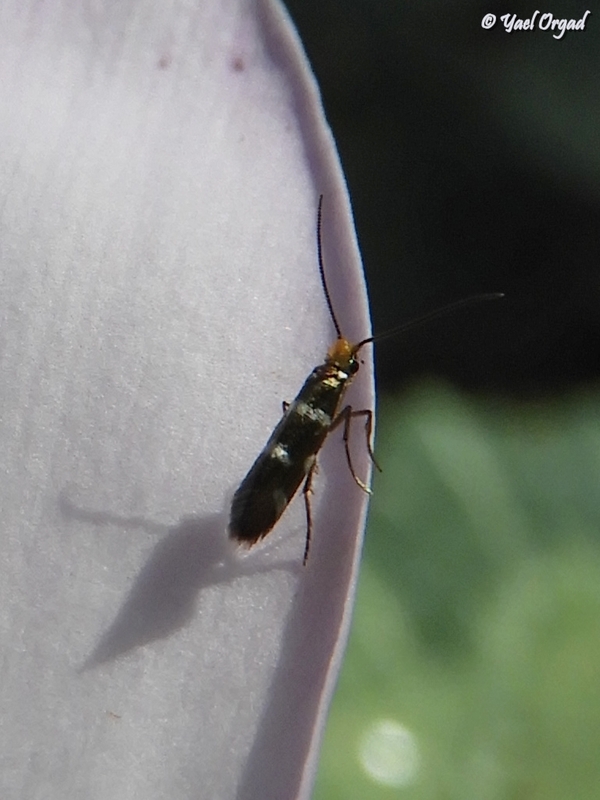 She found also that the common pollinators of the Cyclamen are tiny moths. These are ancient moth species (found in fossils), they don’t have proboscises. These moths enter the flower’s internal parts and eat the pollen. While doing that, some of the pollen falls on their bodies and when they move to the next flower – they pollinate it. These moths are active during winter-time, when the Cyclamens are blooming. Other insects, such as Thrips and Honeybees were also observed visiting Cyclamen flowers at the beginning of the flowering season. February is the peak of the Cyclamen’s bloom – but they have long blooming period: Cyclamen flowers can be seen between December and April. In addition, there is a special variety (var. autumnale) that blooms during autumn, before the rain comes. The heart-shaped Cyclamen leaves are beautiful and have many different patterns. 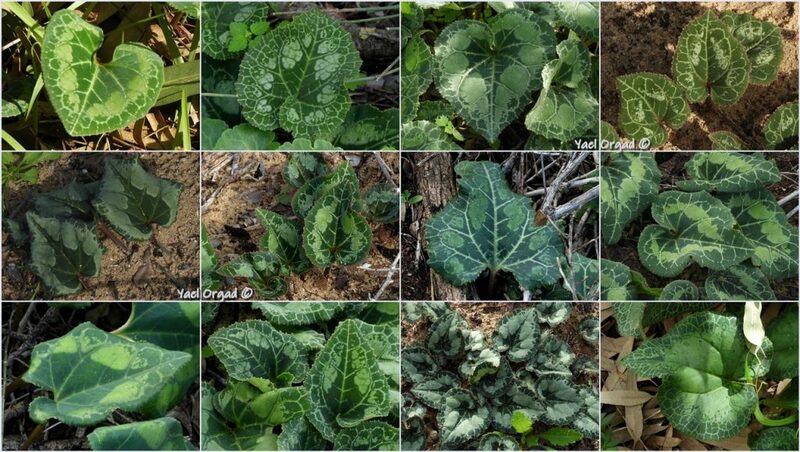 According to estimates, there are hardly any two Cyclamens with the same pattern: the leaves pattern is unique for each plant, like the human fingerprint. The leaves are cooked by the local Arabs and eaten filled with rice and meat. The Cyclamen flower colors are usually gentle pinkish-white, but here and there you can find a Cyclamen with strong pink-magenta colors. There is a legend about these colors: Once upon a time, all Cyclamens were white. At that time the land of Israel was barren from vegetation: no trees, no shrubs or even moss. Then arrived the Lord of the forest, and decided to make the land green. He brought along big bags full of seeds, bulbs, seedlings and saplings and started to spread them all over the land: he planted and sowed – worked all day long. “You’re right”, said the Lord, feeling a little shameful. “But what can I do? I’m all out of seeds and bulbs!” “All out? !” asked the hill. “Wait, I’ll check again” – and he checked his bags, but to no avail – they were empty. “Just a minute,” said the Lord, “I’ll see if anyone is willing to relocate.” The Lord of the forest approached many plants – Oaks, Squills, Mastic shrubs… all the plants refused, each one had reasons and excuses. Suddenly the Lord heard a voice behind him: “We’ll move to the hill! It looks like a nice hill, all it’s missing a flower!” He turned around and saw a group of pretty white Cyclamens. The Lord was very happy. He bent over to the Cyclamens and kissed them – and the shy Cyclamens blushed… Ever since then, you can find white Cyclamens, which was their original color – and pink Cyclamens, still blushing from that kiss. 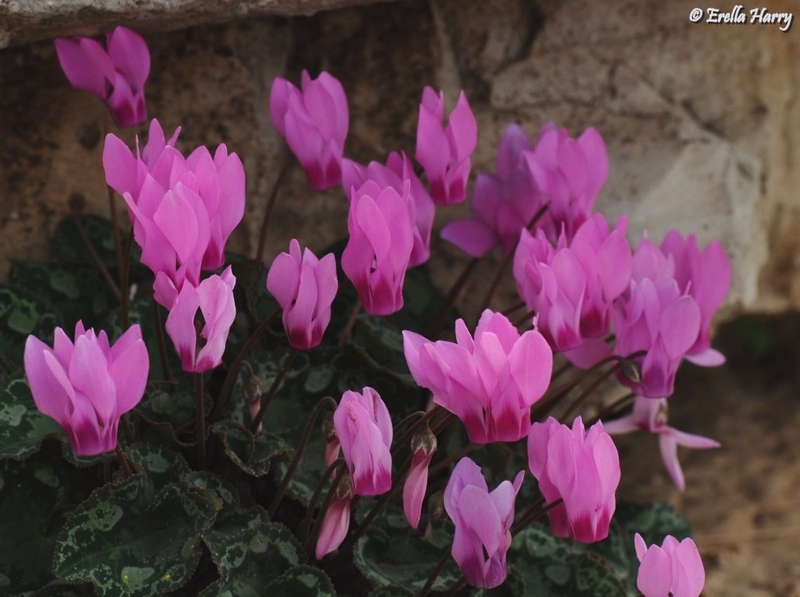 We will remind that the Cyclamen persicum is a protected plant in nature in Israel – as well as the progenitor of all cultivated Cyclamens seen in the flower shops and nurseries. 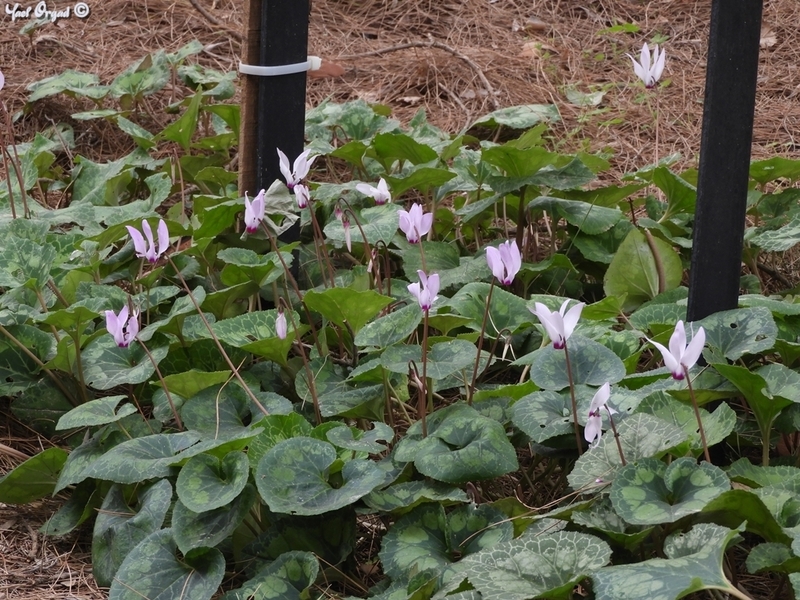 The cultivated Cyclamen bloom impressively only one year and diminish in the second year, while the wild Cyclamens will continue to bloom for many years to come. 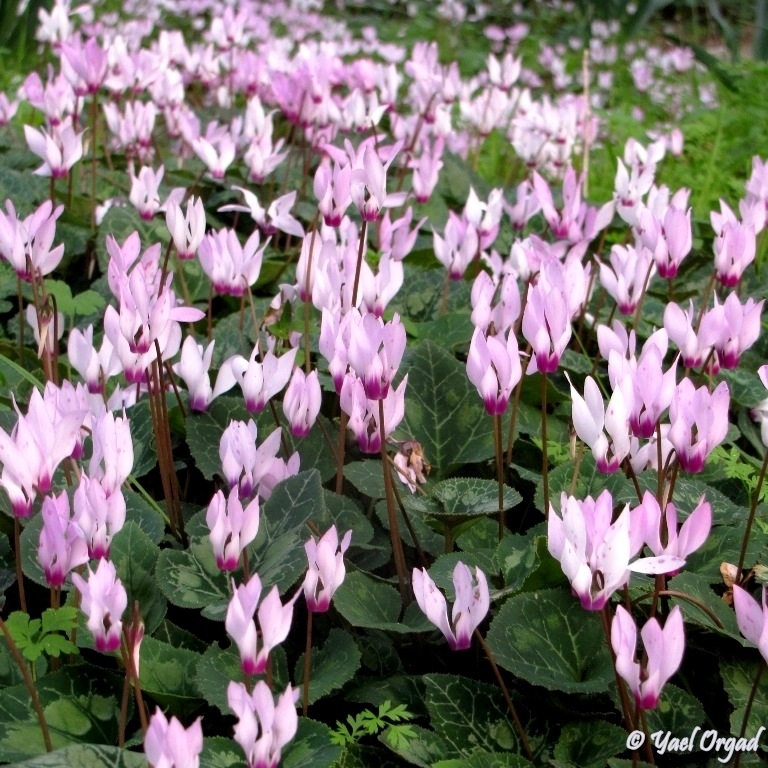 Nowadays you can purchase wild type Cyclamens that are grown commercially. We recommend you buy these ones and in autumn – plant the tubers within cracks in walls and garden rockeries. It’s important not to water them during the summer, so the tubers will not rot. The Cyclamen persicum can be found all over our garden: some of them were here before the garden was established, other were rescued from building sites. 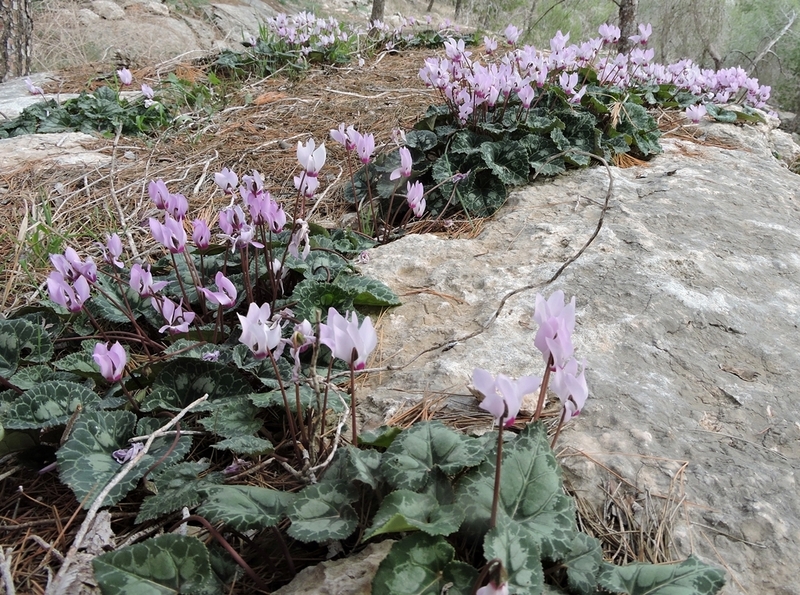 But Cyclamen persicum is not the only one in Israel: Cyclamen coum is a rare plant of North Israel, it is very rare in the Meiron, and a little more common in the Northern Golan and Mt Hermon. In the world there are approximately 20 Cyclamen species, some of them you can see in the garden. In the Mediterranean section grows the Cyclamen hederifolium from the northern Mediterranean basin, Cyclamen maritimum from the shores of Turkey, Cyclamen graecum from Greece and Turkey and also the very rare Cyclamen rohlfsianum. In addition, in the Geophytes terrace you can find about 10 different Cyclamen species!